The Gauteng Enterprise Propeller (GEP) promotes, fosters and develops small enterprises in Gauteng thereby implementing the policy of the Gauteng Provincial Government for small enterprise development. 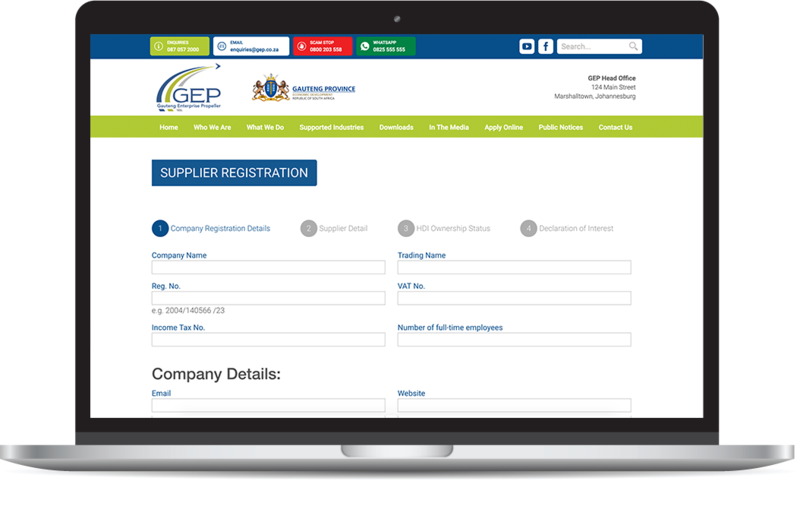 All prospective suppliers are herewith invited to register as a supplier on the database of the Gauteng Enterprise Propeller (GEP). Any enterprise that tender’s for the entity, or enters into a contract for goods, should provide a valid quotation, assets and services should be within the entity’s stipulated requirements. GEP started operating in 2005 and its formation was informed by the province’s Growth and Development Strategy (GDS) which had identified SMME Development as one of the key levers to address the triple challenges of Unemployment, Poverty and Inequality. What can gep do for you? Q: GEP has introduced an online system for application. Can I access the system outside GEP offices? A: Yes you can. The Online System can be also accessed outside GEP offices. You can log on www.gep.co.za, click on Online to apply. Alternatively, you can visit one of GEP regional offices for assistance. You may also call us at : 087 057 2000. The Chief Executive Officer position advertised in the Sunday Times and City Press of 24 March 2019 as well as in the GEP website, is hereby withdrawn and substituted by the advertisement on the vacancies page.